With plenty of curry houses in the area to choose from, it was time to try somewhere new. Leigh Sanders ventures out to sample some food. . . 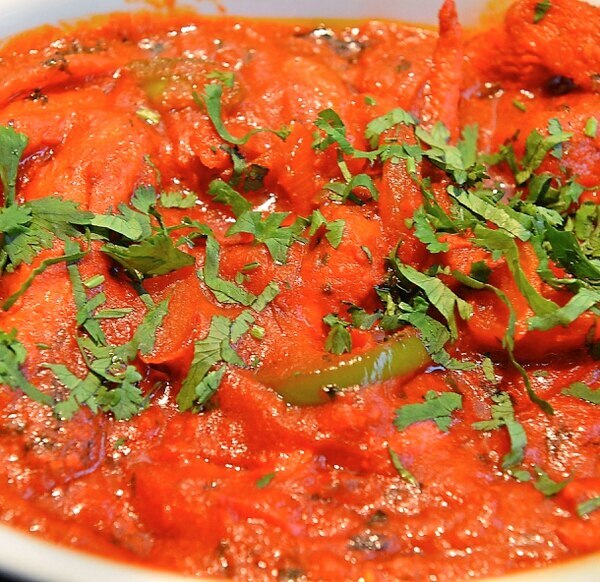 There is no shortage of curry houses to choose from in these parts when picking a venue to catch up with friends. But sometimes, finding something that little bit different – while keeping the costs down as you desperately await pay day to arrive – can be more of a challenge. As long as you have a Des (the dreaded designated driver mantle) with you then sometimes a little venture further off the much-trodden path brings with it great rewards. As any of the big names from the Age of Explorers will tell you – ‘good things come to those who explore’. Well, maybe they said that. 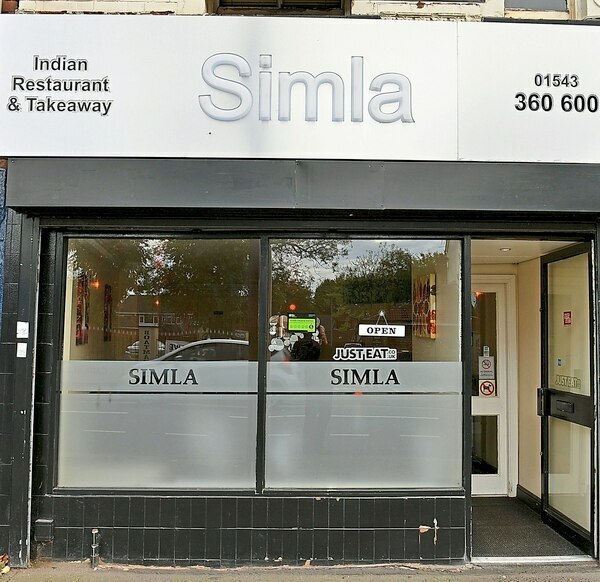 Walsall Wood has its pick of places to eat – there are a string of eateries serving eat in or takeaway curries within a few doors of each other. 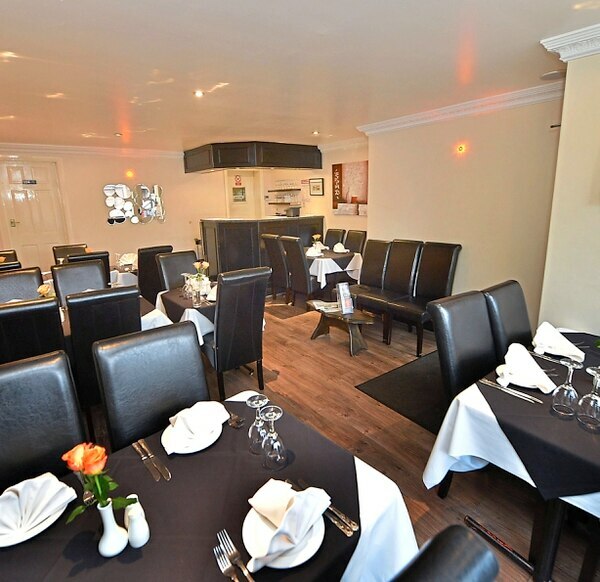 Simla is a more intimate, smaller venue but packs some delicious meals which can be tailored to suit your tastes rather than going with what is offered on the menu. The glowing sign on the outside catches the attention on a dark evening, and it is just as well given if you blink while travelling past you may indeed miss it. Mr Rahman is the most gracious of hosts. From the moment we stepped through the door he engaged us in conversation. He was delighted we had chosen to sample his food. We were the only table taken in the restaurant but a delivery driver was back and forth for most of the evening taking the food out to people’s homes. Perhaps being the sole diners did become a hindrance after a while. Our host became a little overbearing, continuing conversations while we ate to the point where the four of us fell silent in discomfort. But on another night when the venue may have been a little busier this might not have been an issue. And his kindness and eagerness to please wouldn’t have become so intense. It did have its benefits though, as we will come to. The venue is unlicensed. But there is nothing to say you can’t bring your own booze. Given how helpful Mr Rahman was to changing the food slightly to suit tastes, it would be surprising if he would turn down this type of request either. But it would be best to check with the venue before turning up with alcohol. We ordered the usual poppadoms with dips to start. These were nice and crisp and had a good flavour to them. They weren’t the bland fare some places can serve. It is worth noting the starter portions in particular are on the bigger side. So if you plan to have both a starter and main it is worth not overdoing the poppadoms to leave space for the tasty treats to come. Our double date was hotting up both in flavour and conversation. My friends picked the tikka platter to share. 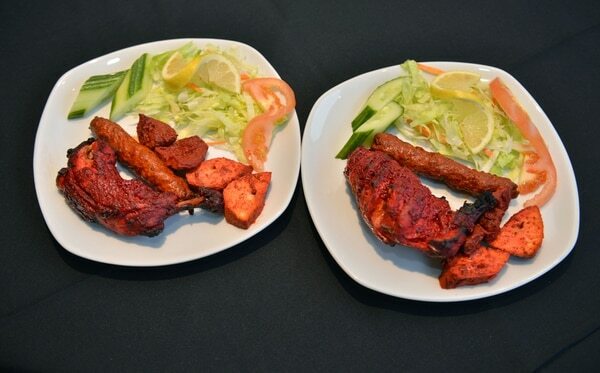 It was made up of tandoori chicken, lamb tikka, chicken tikka and sheek kebab and provided more than enough for both. The meat was tender and full of taste with some left over dip from the poppadoms adding to the flavours. But one of the pair in particular thought she had a bit too much meat given that she had another dish on the way. 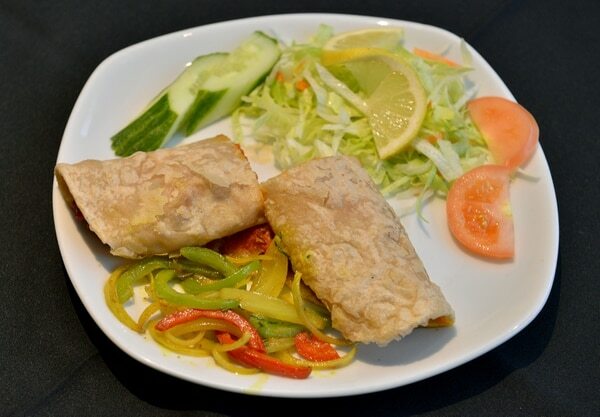 I had the keema chatt, which was lamb mince meat and chopped cucumber mildly spiced with chatt masala sauce and wrapped in a soft, thin roll. It was delicious, with the meat oozing flavour and all kept in place by the deceptively sturdy wrap. The spice wasn’t too forceful and it didn’t feel too heavy ahead of my main either, which was another plus. The other half opted against a starter at first, but she was talked round into having a light snack mixing what the rest of us had ordered by Mr Rahman. A smaller portion than the ones we had enjoyed, it was a nice touch from our host that showed a willingness to please. On top of this, he had told us about recent travels he had made to Dubai to meet relatives who had mixed Italian and Bangladeshi foods to open a restaurant with a difference. He surprised us by serving up one of the recipes he had come home with. It was a chicken dish, covered in a tomato-based sauce which had an overly sweet taste from the mixed seasoning. While nice, the sweetness was a little too much this early on in the meal and for us, it didn’t quite work. But this was a personal thing and we were chuffed he had chosen to share his family recipes with us. We had already consumed a large amount of food, but we were spurred on to eat as much as we could of our main dishes as the high quality of the food continued. On our side of the table we had a lamb dupiaza and a lamb and chicken tandoori murghi mossala with a garlic naan, a cheese naan and a pilau rice between us. The lamb dupiaza was guzzled by my partner and she was impressed by the tender meat and the accompanying sauce. It was smooth, yet hid a kick just enough to excite her much-more-adventurous taste buds than my own. It comes with a sauce containing onions and ‘treated with dozens of spices’. 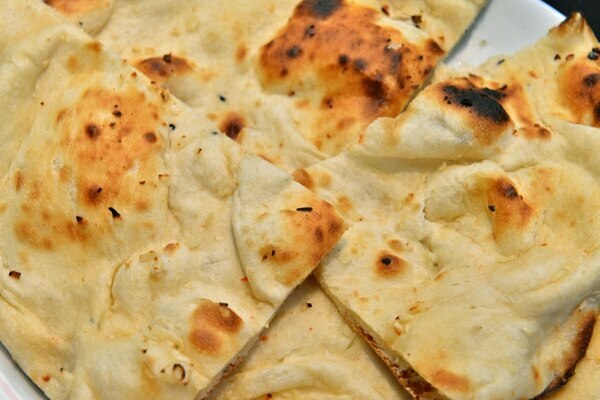 The naans between us were a nice mix of crispy edge and soft centre and my cheese naan in particular packed a nice texture, but perhaps could have contained a bit more filling to really push the flavour of cheese through. My murghi mossala, though, was smashing. The chicken and lamb was also mixed in with mince meat to add to the full-blooded meat feast, while the dish also came with a soft boiled egg to give a different texture covered in herbs. It was perfect for me, poured on top of the naan to mix up the flavours. 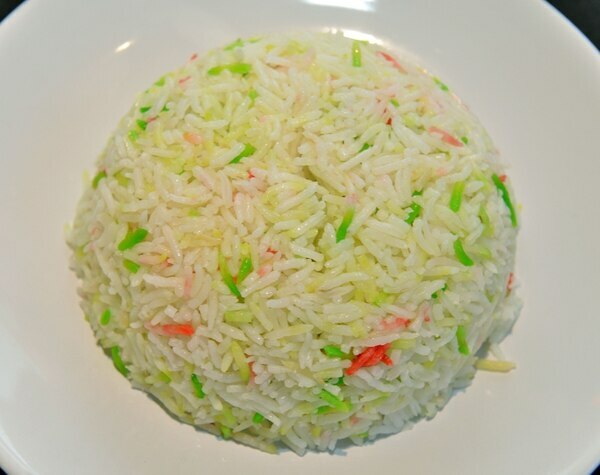 On the other side of the table they, too, had chosen the garlic naan and pilau rice combination for their accompaniments. Our male companion had picked a chicken jalfriezi which came with fresh green chilli and coriander leaves mixed in. He said it had just the right amount of spice for his tastes and he came closest out of the four of us to finishing it off – so he must have enjoyed it. As for the fourth and final companion, she went left-field and picked a mango malai – marinated chicken (or lamb if you prefer) cooked with coconut yoghurt and mango slices. 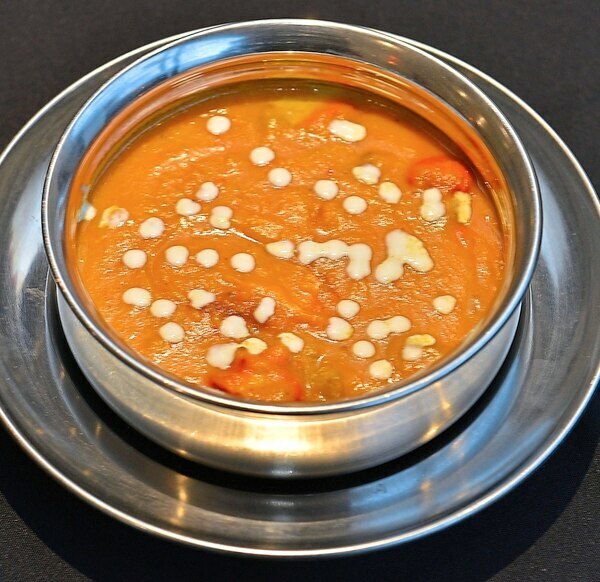 A milder form of curry, it came served in a quaint metal dish that was heated up on the fiery stove in front of us before being served. She found it a little too sweet for her tastes, like a dessert rather than a main course. But, she did enjoy it to a degree and said it was her own preference rather than the food itself that was the issue. I had a taste myself, and it certainly packed a sugary punch. We hadn’t got anywhere near the end of the food before our stomachs were screaming out for us to stop. Mr Rahman kept up the hospitality and offered to bag the remainder of the food up for us, even offering us fresh naans to take home and have the next day with our leftovers. Despite being a little overbearing at times as previously mentioned, he didn’t let the top level of service drop all night. With the extras he provided we thought we had had more than enough food for our buck. And as we waddled off caressing our food babies into the night, we made a mental note to come back and be treated like kings again in the future. 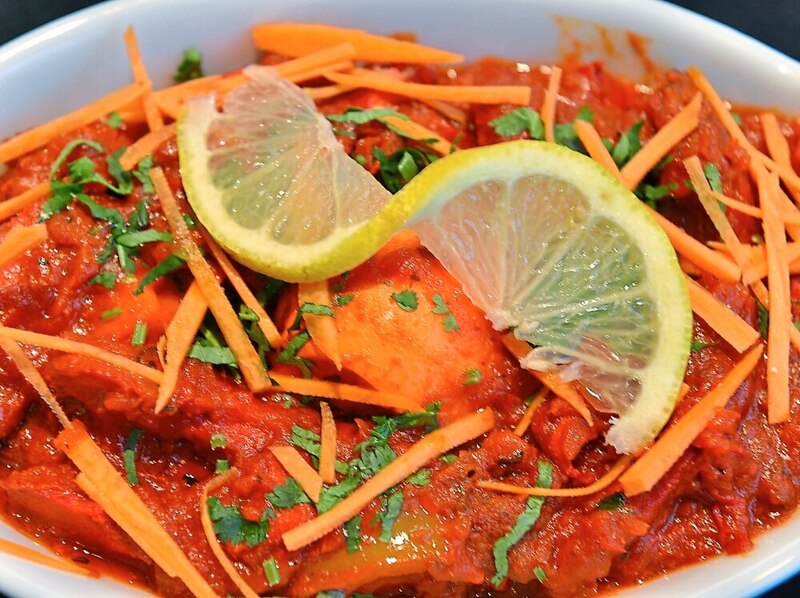 There is so much more on the menu to try, and we would be fools to order something too Simla.